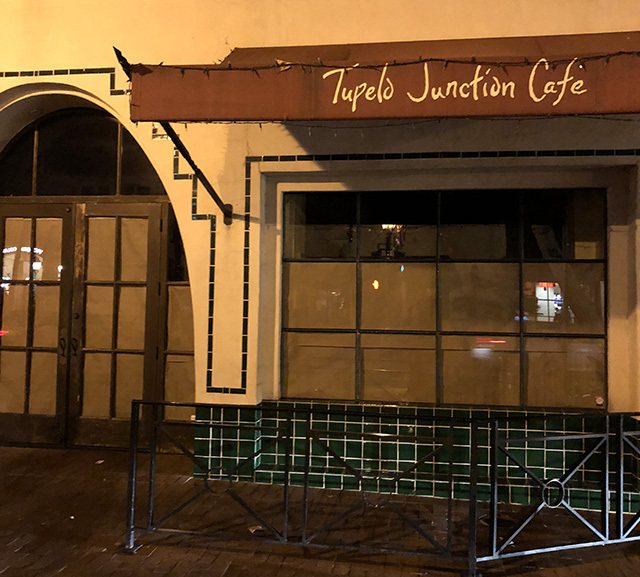 Tupelo Junction Cafe at 1218 State Street sold their liquor license recently. I called them to get the details and was told by a representative that they will continue be open as usual and will switch to just beer and wine in the near future. Two days later the restaurant closed, the windows were papered over, and their phone number was disconnected. No explanation was posted outside the business and their web site has not been updated to reflect current events. They have been closed ever since. Wild speculation, but I wonder if they’d still be in business if they were still on Chapala. My wife and had one of the most shockingly bad meals in our lives here about a year or so ago, so something was totally off. When something goes from yummy to garbage something is very much amiss. Like, how do you mess up mac’n’cheese? But they did. Wait, you’re not Ted. I’m Ted. Wait…am I Ted? Good God, there is a rip in the fabric of space and time. Better sort this out! I’ll miss their beignets. I guess I’ll now have to make do with going to Solvang for aebelskivers. You can get beignets at Cajun Kitchen. They’re pretty good. Not as good as my favorite at Toulouse Petit in Seattle, but decent. Thanks for the tip. I had no idea Cajun Kitchen had beignets. I’ll try them. I will miss the beignets, Crab Cake and Potato Hash with Poached Egg, Crab Claw Blood Mary. This was one of my favorite restaurants and when my brother and his wife came to town we always went there for breakfast/brunch. Sad day. They moved to Newport Beach. LOL! They lied to John. Checkout Johns 11/13 post. People at there new location should know how they treated their employees, and Santa Barbara in general.